← We have our repot winners! 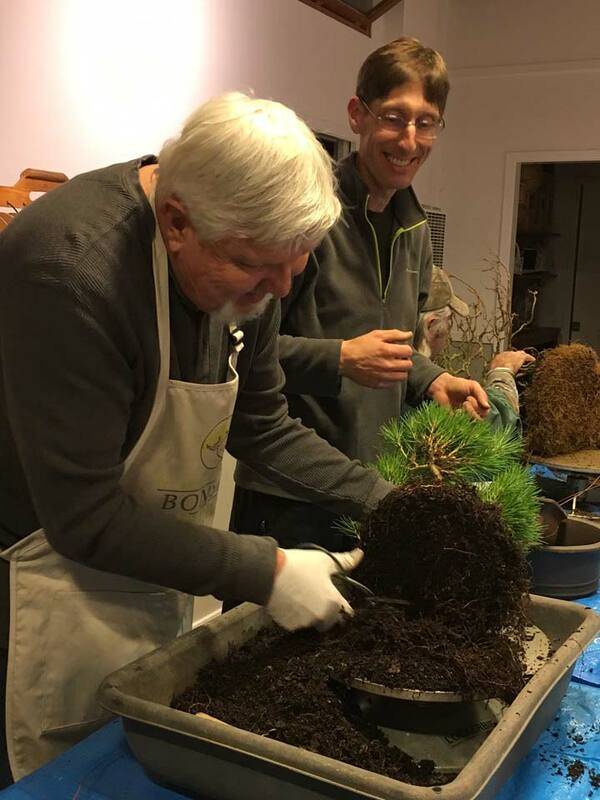 Jonas Dupuich, famed author of the excellent Bonsai Tonight blog, helped us kick off our 2017 repotting season with a special demo on the first Tuesday this month. 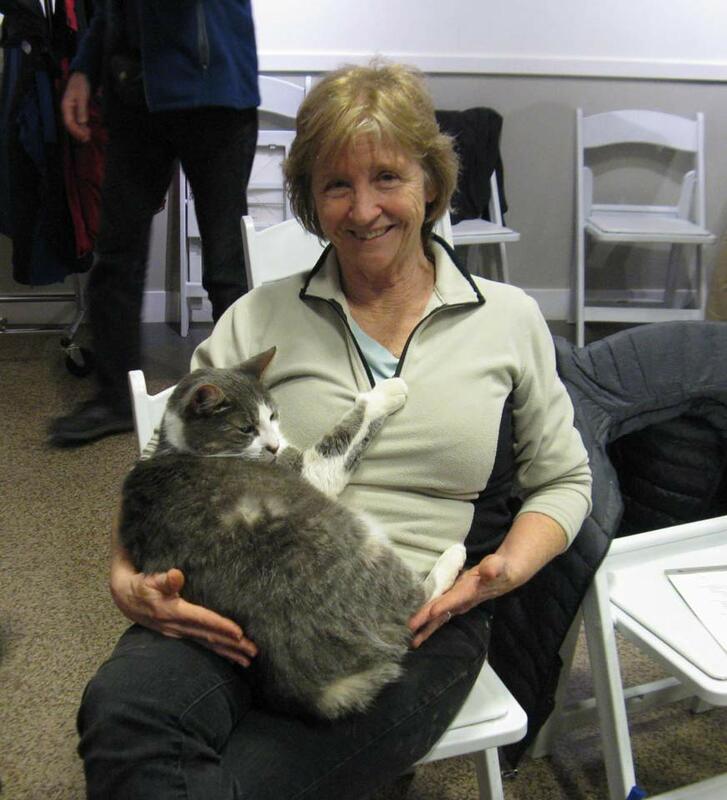 The two dozen members present, plus one woman, Caroline, who came to our meeting for the first time specifically to see Jonas’ demo, all received a review of some of the basics, and many special tips to prepare for the work ahead. 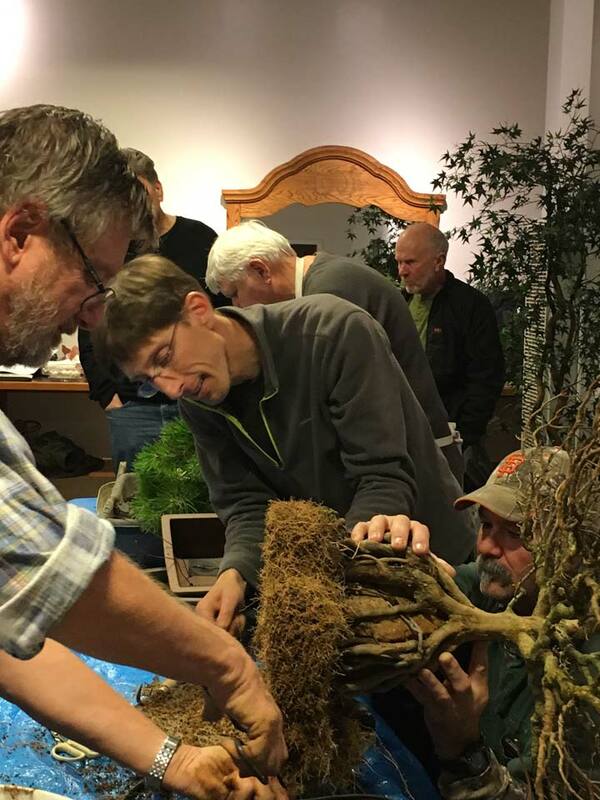 If you couldn’t make it to Jonas’ demo, hopefully these notes will help you get ready for our repotting workshops on January 17th, February 7th, and February 21st. Based on a raffle from the previous month, two members’ trees were selected to serve as Jonas’ subject matter. 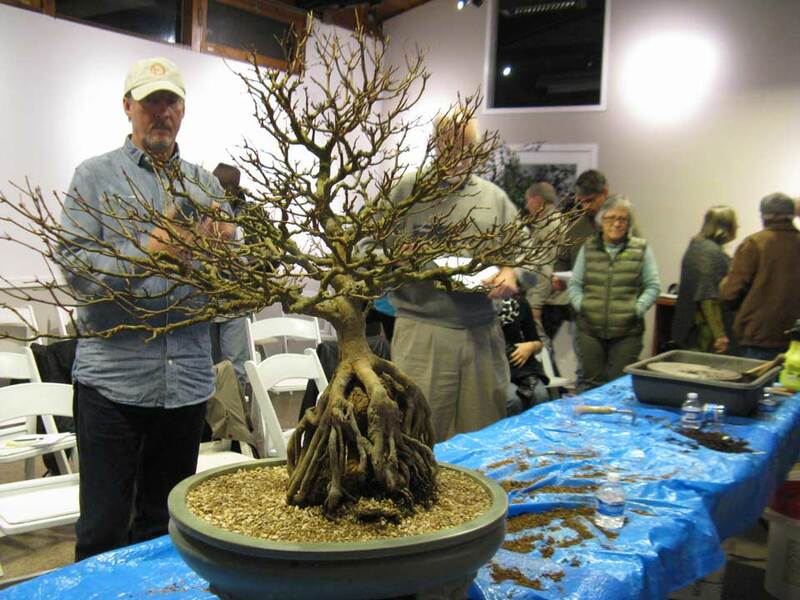 Rather than attempt the daunting task of repotting both trees himself, Jonas guided the trees’ owners through the process. 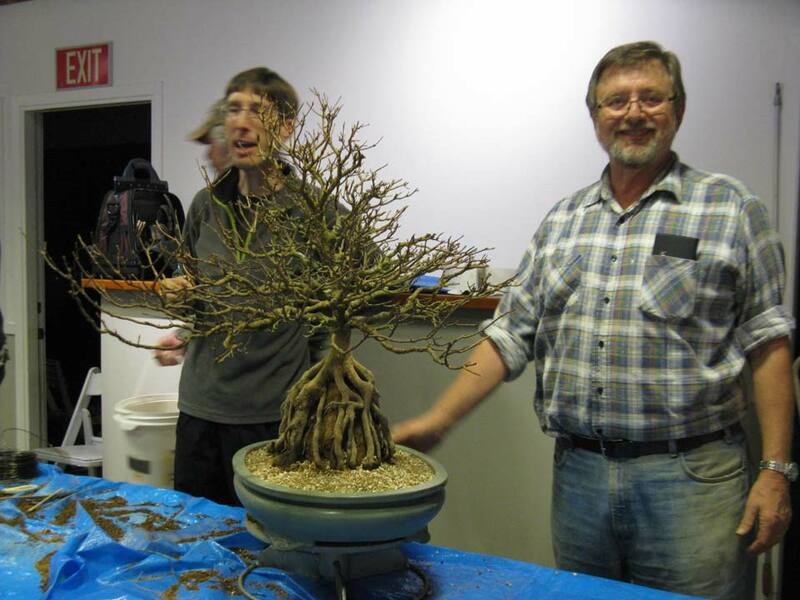 George Haas was placing a young black pine into a bonsai pot and soil for the first time, and Adam Petras was refreshing the soil and trimming the roots on a lovely, well-established, root-over-rock trident maple. After quite a bit of discussion with Jonas and the assembled group, Adam passed on the selection of possible new pots he had brought with him, choosing instead to put the tree back into its original pot. 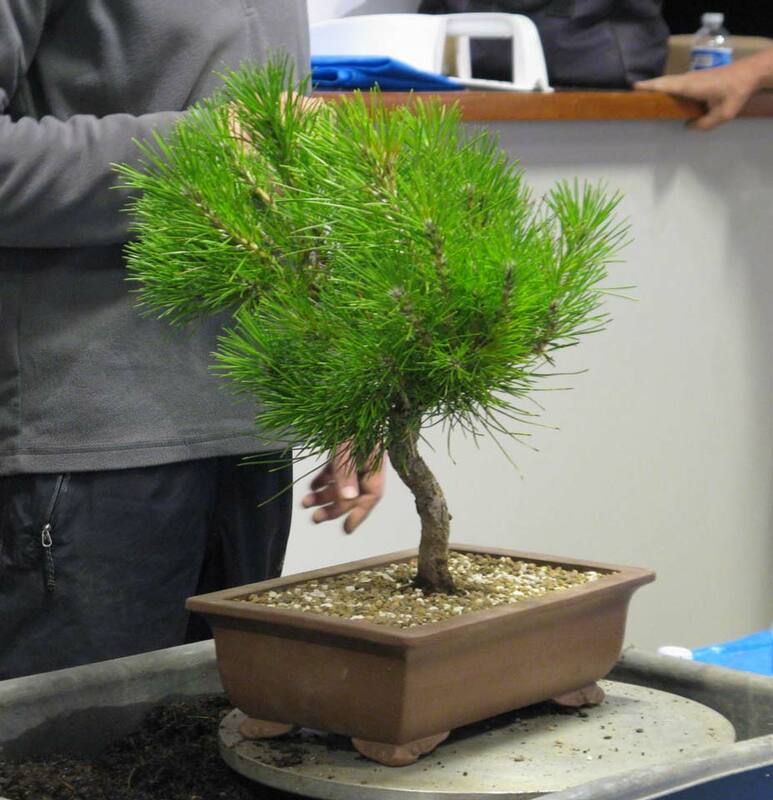 Jonas brought a handout with him containing details about when to repot certain trees, soil mix suggestions, and a simplified list of the standard steps in repotting a bonsai. He purposely left the list of steps simple because he wanted to encourage discussion and elaboration as George and Adam progressed through the process. If you would like a copy of Jonas’ handout sent to you, please contact Candace Key. That basic information will not be reproduced here. Rather, here are some of the tidbits of information Jonas added throughout the demo. One thing Jonas mentioned that many people don’t realize is that when you use a sickle to cut around the roots of the tree, to free it from the pot, it is best to slice across numerous times, like you would if cutting something thick with a razor blade, rather than cutting all the way down in one spot and trying to saw across. Also, you should only need to cut three of the four sides, because one edge shouldn’t stop the tree from being tilted out of the pot. Another useful tip, once you’ve gotten your tree out of its old pot and have begun to clean and trim the roots: If the tree is large enough that you need to lean the tree on one side to get to the bottom of the roots, try to work on the leaned-on roots last, otherwise you will crush and bruise tender newly trimmed roots. Sharply trimmed roots are dramatically more likely to survive than battered ones. For the same reason, when raking the bottom of your root ball to remove old soil, long scraping motions are better than short, “picky-pokey” stabs. One more tidbit that only experts like Jonas tend to know: If you’re not bare-rooting your tree and are leaving some of the old soil, it is best to leave some of the roots sticking out of the old soil. This is because roots apparently have a more difficult time growing new shoots into the new medium from the old. If some of the established root projects into the new soil, it helps the tree acclimate better. That one sure elicited a chorus of “Hmmmmm!” from the crowd. Here’s a specialized tip: Ginkgo biloba owners beware – don’t trim too many of the roots on the bottom of the root ball or else the tree’s top will die. That might have cleared some things up for more than one of us. There was the inevitable, but mercifully short discussion about using copper versus aluminum wire for your tree tie-downs. Jonas hasn’t seen any evidence for the suspicion that copper wire can make trees sick, but still doesn’t see any reason to use expensive copper wire for tie-downs. When using aluminum, and twisting the final tie-down properly, 2.5mm is probably the largest size wire you will ever need for any size tree. The most commonly used sizes are 1.5 and 2mm. Jonas coached both George and Adam to use the all-around-the-tree, pigtail version of tying the trees in place. This is where you attach an extra piece of wire, the “pigtail” to your starting wire, then tie each wire to the next, circling around and ending with the pigtail. This encircles the tree roots rather than simply crisscrossing them. When doing this, Jonas recommends having the last point of tie-down and overall tightening at the point most opposite to the direction the tree tends to lean. In most bonsai, this would be somewhere in the back. Get busy on those trees! Don’t forget how early the maples started waking up in recent years. If we get another January or February warm spell, you can say goodbye to repotting season. Looking ahead, we will be having a team demo from our own Chris Ross and John Doig on March 7th, and then a presentation from Ryan Nichols on April 4th. Stay tuned for further details about those, and see you at a workshop soon!